I usually participate in these prompts when we have less than 75 words. However, I felt like writing and my thoughts went towards love. Why? Why not? Thank you to Sammi for hosting this weekly party. It really pushes me to try different things. From whence came my notions of what love is? Where have I learnt what love I deserve, or don’t? Dare I assume I should be loved in a certain manner? How can we not expect to believe we deserve it as well? 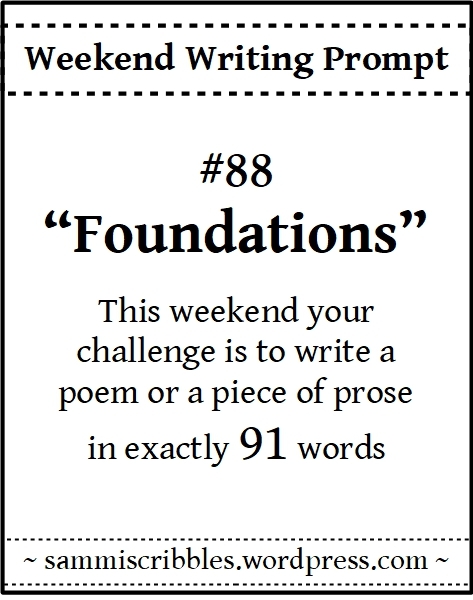 This entry was posted in Love, Prompt, Weekend Writing Prompt. Bookmark the permalink. Well now… what does one say to that? And which play or sonnet does that come from? As I have but by chance come off with a Shakespearean air, I dare not give proof of my lack by responding with ill attempt at wit. You are most kind to say so. Having once known love is more than most can even ask. I keep telling myself… Beautifully voiced. And – I am guilty of being verbose… which is why I do these challenges. Coz they’re bloody hard!! Words and thoughts to ponder. Of course you deserve to be loved. Beautiful photo. Sending my love from the Midwest. I like to think they make one ponder. Don’t we all? Yay! I really like this, and in exactly 91 words. Sheesh! Thank you, Resa. Hard to have to cut – and add!! Well done! I do wonder, if perhaps even the best foundations do not stop these questions from being valid ones to ask, only that having strong foundations perhaps allows one to truly explore these very questions … Hugs! What I wonder, is if the foundations are sound. There are instances where one thinks love comes with physical pain. How do they understand the “real” thing when it comes without? And can they believe in it? Thank you for getting my point… And it’s not just the possibility of physical pain and “love” together either. Another good point, yes, it is not. It reads like a classic love song! And you did it in how many words? Of course I know, 91. Which is wordy compared to your last challenge, 😉 But it’s not surprisingly in the least that you stuck the landing on this challenge. Again! You do brevity with such flair and loveliness. I do appreciate having you in my cheering section! You gots the good on these challenges And then sum. (Not a typo). To brevity and smarts and passion and the ability to wrangle ’em up into a beautiful stretch of words. The troof, the whole troof and nothing but the troof! So help me Gawd. You do so well at these challenges, Dale. And this is so true–of course you deserve love. But part of that is that you also know how to love. Thank you, Merril. It means a lot. Thanks… the dreary outside begged for a glimpse of summer. Yes. Still dreary here, too. Ugh… gimme snow at least! Have you seen the comedian Daniel Sloss’s special Jigsaw. He does a bit about how life is like a jigsaw and the center piece is the thing that makes us complete, but people get some desperate to fill it that they’ll shove anyone into it and keep smashing at it until it fits. They get stuck in relationships that are wrong because they fall back on ‘but they love me’ when really they it isn’t love because they don’t love all of you and in the end, that doesn’t work. Expectations are important sometimes to keep us for settling for relationships that in the end, don’t make us happy. Thank you, Carol. You have totally gotten what i was trying to say. No, I haven’t seen it but you can bet I’m going to go search for it on YouTube! It’s a Netflix special so I’m not sure how much is on YouTube. Well worth a watch if you get chance though. Then I’ll check on Netflix (and hope the Canadian one has it). This “no expectations” crap is nothing but a recipe for failure. Someone lazy came up with it. And you deserve what your precious heart desires! Such a good question that you pose : what love is. Your questions set me thinking. Thank you Dale. That pleases me greatly, Francine. It’s what I was aiming for! Thank you, Ina. That it is. Well now… two two tell me that. Where did I learn this new talent? Oh my my … the last line is powerful. Foundations are the key to so many things in life – including love – which is something everyone wants. FYI: A newbee at the concert. … one you know. You nailed this on so many levels. Style, tone and POV. Yes, don’t assume/ expect and don’t be disappointed. But, when you know what love is, and while it will never be the same twice, you know it’s possible. It makes you an optimist. I loved every single word. You filled my heart with hope. Thank you Dale. Blimey, Dale, you ARE far more profound than you let on…… A beautiful piece of advice to look into our own heart and soul! I believe in LOVE anyway, so I’m not surprised – everything goes better with a little love added! Blimey, Kiki! What say you? YES, you say it all in 91 words. To L O V E!